In India tea is served spiced and sold on the street by the Chai-Wallah, the chai guy. 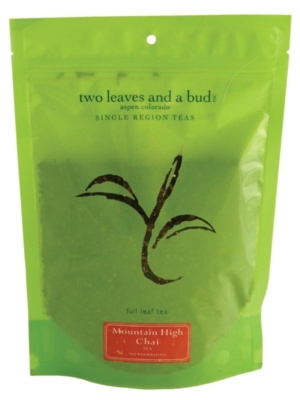 Two Leaves' Mountain High Chai has a taste so authentic, it's like taking a trip to India in a cup! This is a spectacular breakfast tea; it has a full, layered flavor to alert your senses and contains a more reasonable amount of caffeine than coffee to provide the much needed A.M. pick-me-up with less of the jitters. A cuppa' Mountain High Chai makes a great start to your morning. It's mighty tasty on it's own, but you can also create a smoother taste (try it with milk) or a sweeter taste (try it with honey) or both (YES!) and you're likely to find a mountaintop sunrise in your 'cuppa. Boil & Steep time: Full boil, steep for 3 minutes.